One thing is certain - America loves its coffee! Join us in an industry that grosses over 10 billion dollars annually! 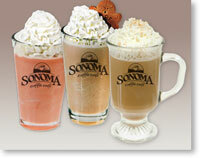 At Sonoma Coffee Café, we offer an Adventure in Every Cup with our premium coffees from around the world! As a Sonoma Coffee Café Franchisee, you will receive an enormous wealth of experience and training along with a simplified, turnkey package. So, what makes us different from the rest? We deliver unmatched flexibility! No other major coffee franchisor can offer the kind of support and help SCC provides while also giving optimal franchise flexibility. A select few financially qualified individuals with business savvy and experience will enjoy the opportunity to become a Sonoma Coffee Café Area Developer and benefit through significant streams of income from multiple locations. This means higher profits for you and the profit picture in this industry is absolutely phenomenal. (Starbucks didn't open all of those stores just for fun). Our team of seasoned professionals shares decadesof experience in the specialty coffee industry. They know what you need to get your store up and running and make it happen smoothly every step of the way. Sonoma Coffee Café and Partners Are There For You. Our assembled team of experienced professionals brings you a complete café package. Your team members are here to help you with financing, SCC is listed on the SBA registry to add strength to your funding request by giving you premier status. They provide assistance with site selection and lease negotiations. They supply a turnkey package for your store by providing architectural design and permitting, construction build out, a complete equipment and interior package, training and support to prepare you to serve your customers. They can help your store become successful by assisting with branded consumables and merchandise as well as advertising and marketing solutions. Additionally, our vendor partners offer business structure setup, business planning, payroll and accounting. Our product line is just as important in providing a strong foundation for your operation. You can sell confidently with high quality products from SCC vendors. From the award winning coffee of Fieldheads, to the superior gelato from Villa Dolce, as well as excellent products from Dr. Smoothie, MoCafe, and others. Sonoma Coffee Café is uncompromising when it comes to quality. Café - A Sonoma Coffee Café located in a strip center or mall. A traditional and proven concept in the industry with a history of delivering superb gross revenues. Supplement your profits with sales from items thatwork in your market. Your menu can include; breakfast items like bagels, donuts and breakfast sandwiches. Or take your business further and expand with gelato. Gelato and coffee go together and adding gelato to your menu will put smiles on customers' faces. As another revenue stream, gelato sales will put a smile on YOUR face. Coffeereview - the most respected reviewer of specialty coffee - gave both our regular and decaf espresso roasts a score of "Outstanding". But we didn't stop there. Our entire menu of Smoothies, Teas, Cocoas, Frozen Coffee Drinks, Chai and more are all made with the highest quality ingredients available in the market. Sonoma Coffee Café believes it is your business--you paid for it. We withhold no reasonable approval to offer local food and beverage items that will build your revenues and profits. You'll find that costs are usually between $50,000 to $100,000 less with Sonoma and that Sonoma Coffee Café offers the greatest value… and we get it done in a timely fashion. Please fill out the Request for Information Form below and we will respond very quickly via phone to your inquiry. Thank you for your interest in Sonoma Coffee Café.